Students move in their peers in GCU’s pay-it-forward Welcome Week culture. 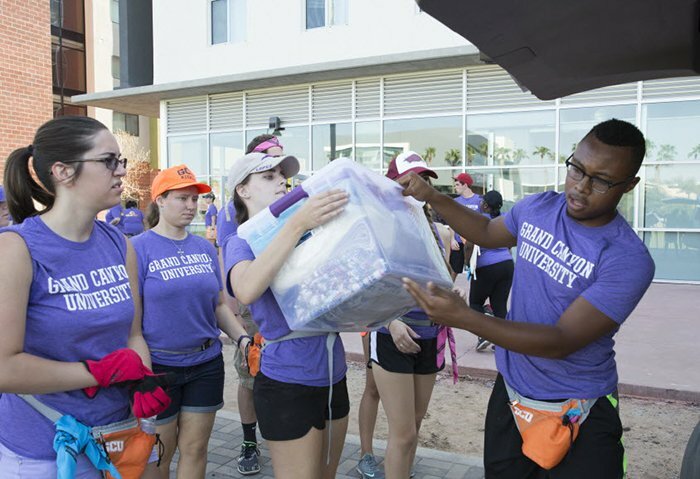 It is fitting, in a university culture that emphasizes helping others, that the Lopes begin each school year by helping each other move onto campus. 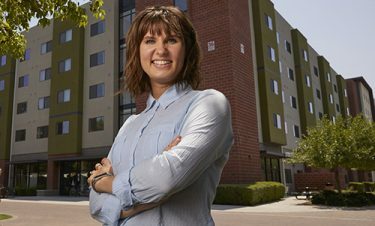 From the Luggage Luggers of 2004 to the Move-In crew of 2018, Grand Canyon University boasts a lengthy history of welcoming resident students to campus by moving their pillows, blankets, clothing and posters into their residence halls and apartments. 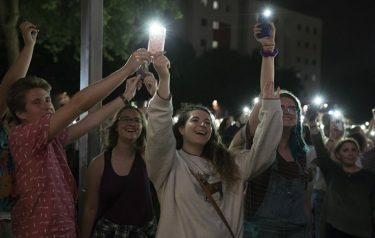 While the rapid and substantial increase of campus residents has necessitated a Move-In process requiring months of planning, myriad logistical challenges and thousands of volunteers, the sheer numbers have not deterred the mission, according to Charity Norman, Director of Welcome Programs. “We do talk about it year over year: Do we want to continue the structure that we have now?’’ Norman said. “We ask, how sustainable is this? And in true GCU fashion, we commit to making it bigger and we find a way to make it work. Every year we have more and more students who come back and want to volunteer, and for the past couple of years we’ve been able to have more and more staff rally around and help to move in the volunteers, and even now we’re reaching out to alumni. And we’ll just continue to look for ways that it can continue to work. The goal is to welcome one and welcome all, even if it takes awhile. As family members wait in each car, patiently snaking around and through campus, the enthusiastic, energized volunteers provide entertainment. Students enthusiastically greet families as they wait in line to have their vehicles emptied. New Students Program Coordinator Erik Nelsen experienced Move-In for the first time last year and has played a major role, along with Norman and their staff, in planning this year’s edition. The year-round planning process is transformed from Excel spread sheets to the laughter and smiles of family members delivering sons, daughters, siblings, grandchildren and cousins to Lope Country. Welcome Week, scheduled for Aug. 20-25 this year, encompasses Move-In and a plethora of activities designed to acclimate newcomers to campus and enable returning students to get reacquainted before the start of classes on Aug. 27. Move-In dominates each morning, and activities, both large and small, take center stage each afternoon and evening. Between Aug. 17, when the students who volunteer to help with Move-In are aided with their own moving process by 300-400 student leaders and 250 employees, until Aug. 25, approximately 12,000 students will move onto campus, the most in a school history that dates to 1949. Energy is high and welcomes are warm at Move-In. The growth of the eastern side of campus necessitates two driving entry points and 300 more volunteers, according to Norman. All new students (freshmen and transfers) are moved in Monday through Wednesday, while returning students move in Thursday and Friday. (For a video view of Welcome Week, click here). The organizational nightmare facing Norman, Nelsen and their staff grew out of a process from 2004, when records show that “a dedicated team will be on hand to help with your bags and show you around the place.’’ By 2010, surging enrollment necessitated a traffic map and volunteer training, according to records unpacked by Norman. Move-In was limited to one day, from 8 a.m. to 4 p.m. The tasks of directing traffic and parking lot attending were assigned to “20 bodies,” there were 75 “Luggage Luggers” for Hegel, 75 for Canyon and 15 for North Rim. Check-in was handled by eight volunteers. After check-in, students were issued a coupon that permitted them to enter their dormitories. In 2011, under the guidance of Sarah Thatcher, the tradition began of inviting student volunteers to return to campus early to help with Move-In, and the name was changed to Welcome Week Crew. The following year, Move-In expanded to two days and 350 volunteers, only 50 of whom were students. By 2014, the WWC grew to more than 400, and when Norman took over in 2015, 873 students were recruited to volunteer. One key to keeping the well-oiled Move-In machine moving is ensuring that drivers never leave their vehicles, according to Norman. Concerns about valuables are allayed by the recommendation that students and their non-driver family members carry their own valuables, including laptops and medicine. The speed packs (carts on wheels that fit in elevators) and well-hydrated volunteers, students and their families (thousands of bottles of water are distributed) ease the effort on blazingly hot August mornings. Close adherence to the sticker system — items are pre-labeled by room numbers — resulted in only two out of 18,000 items reportedly staying lost last year. Everyone gets in the spirit of the Move-In experience. Once students are settled into their rooms, opportunities abound to get acclimated and meet other students. There are socials for out-of-state students, transfer students, international students, commuter students, ROTC students, freshman students and residents on each floor and in each residence hall. 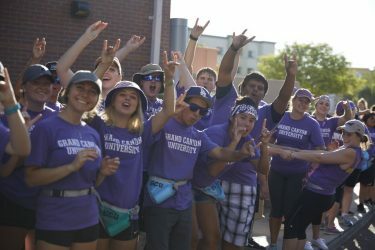 The Associated Students of GCU returned to campus in late June to begin making Welcome Week event plans. Fifteen of the 126 clubs were selected to plan events and attract participants via the event calendar and inclusion in the new GCU Engage app, which shows students what’s going on and how to get there. For example, for students arriving on Monday, a Dance-off is planned on Lopes Way from 12:30 to 2 p.m. On Tuesday, there is a beach resort party in the quad, a board game night, and an eSports & Arcade tournament. On Wednesday, there is a multi-club fair and a multi-cultural festival. One of the most anticipated featured events is the Mock Crime Scene Demonstration from noon to 2 p.m. on Friday. The options multiply throughout Friday, including a sand volleyball tournament from 5-11 p.m., the opening of “Ring Round the Moon’’ at 7:30 p.m. in Ethington Theatre and a Purple Pancakes party from 9-10 p.m. on Lopes Way. The Ultimate LopeVenture dominates Saturday as Lopes participate in a challenging and dynamic “Amazing Race’’ type of contest. The third-year program, LopeLife 101, is part of the meet-and-greet aspect of Welcome Week, with an essential information element. Within each residence area, students will come together for mandatory learning sessions centered on social success and academic success, including an introduction to tutoring opportunities in the Learning Lounges and an orientation to the Loud Cloud online software system. Ignite symbolizes God’s light to start each new school year. No move-in times are available on this day.